It’s that time where I clean out my bathroom drawers. I’ve tried many products over the past few months and I definitely have thoughts to share on them. Below are some of the products I have tried over the past few months. Since I have managed to use each product until they were empty, I will repurchase. Not only does this stuff hydrate but it plumps the skin with it's hyaluronic acid. Great for reviving hair and getting rid of frizz. I love this because I have seen a huge difference in pore size. Plus, my skin seems less oily throughout the day. This stuff is AHhhmazing! It feels just like water. It isn't sticky or drying but it removes make up easily. I have fine/oily hair so finding something that will keep my hair fresh, light weight and non-drying like these have been wonderful. They smell great and help build volume. 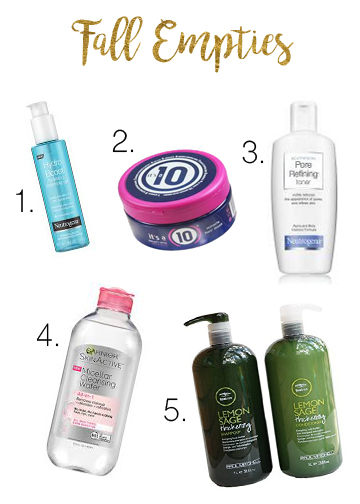 Have you tried any of these product? What did you think? Comment below!